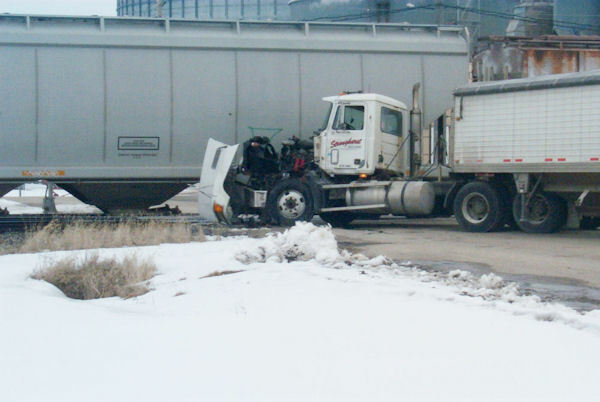 Two Stronghurst men owe their lives to their quick actions at 9:50 a.m. Monday morning, March 1st, as they managed to escape being hit by a BNSF freight train at the Broadway Street crossing in Stronghurst. Jerry Nortrup, 57, Stronghurst, a driver for Stronghurst Grain & Mdse had engine problems with his 1994 Mac truck trailer so a tractor was sent from Stronghurst Grain & Mdse to pull him back to the elevator. The farm tractor was being driven by Nick Tapscott, also an employee of Stronghurst Grain & Mdse. As they were crossing the tracks at the Broadway Street Crossing a BNSF freight train, going between 30-40 mph approached causing the gates and warning lights to activate. Hearing the whistle of the train, the two men jumped from their vehicles and ran for safety knowing they could not get the vehicles across the tracks in time. The train struck the tractor strewing pieces of it down the north side of the track and lodging the main part under one of the rail cars. The semi received major damage to the front end, however it remained on the roadway south of the track and was not pulled under the train. Responding to the accident were the MST Fire Department, Ambulance, City Police, Henderson County Sheriff's Department, Illinois State Police and the BNSF police. The Illinois State Police are investigating the accident. 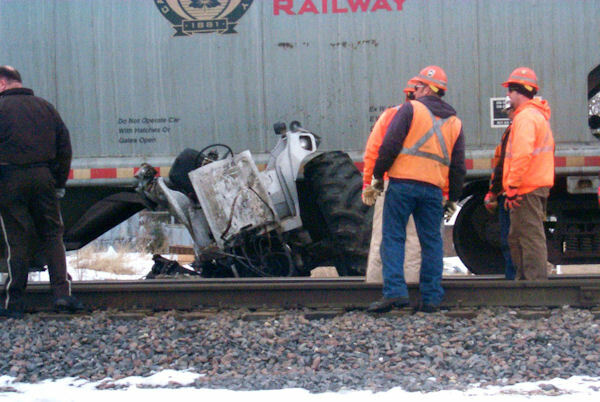 The remains of a tractor after being struck by a freight train is being studied by police and BNS officials Monday. From left Jerry Nortrup,Craig Campbell and Jacob Walker of Stronghurst Grain & Mdse. 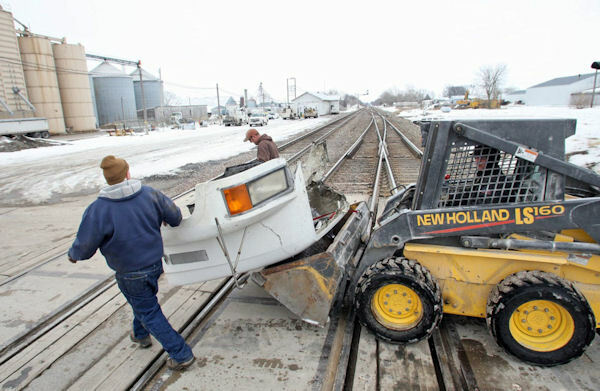 are busy moving the front of a semi off the track Monday after a train hit a tractor that was pulling the semi across the tracks and back to the grain facility after it had engine problems. No one was injured.